What did you think of Barts? Brilliant bar ... highly recommend if you're looking for something different to do, service is good, cocktails are nice and the vibe is cool. Went to Barts with the girls for pre-drinks the other day, and had so much fun! Didn't wanna leave when we had too, was such a fun place. Lots of hot boys, and a great staff! Drinks were reasonable priced as well, which was a big plus! Was take to Barts for a date last week, and it couldn't have gone better! The cool concept gave us something to talk about, and it really set the mood. Exciting atmosphere and excellent drinks. We ended up staying the whole night, and both agreed Barts is one of London's best bars! Finally a bar that's different!! Really clever concept. The excitement starts when you really have to bend over backwards to find the place! It's well hidden.. The staff were really nice and helpful, which made us feel very welcome as well. I can really see why the royals come here! Going back soon! sssshhhhh. ahaha I love this place and its quirky nature! Those with a sweet tooth should try the 'In Vogue', delicious! Jackpot! I have found the only bar in london with a sense of FUN! Where else can you drink a tobacco infused cocktail and wear a wig whilst staring at the Mona Lisa?! What a fun bar! Drinks were delicious and reasonably priced.....really really enjoyed it! I headed down to Barts last week with my girlfriend as I am sick and tired of the boring and unoriginal bars which plague the area. What a surprise! Staff were charming, even the security guy on the door was welcoming. 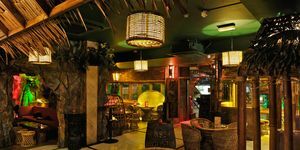 The bar itself is extremely well decorated in the atmosphere is cosy. Only minor problem to my visit is that it was a little crowded but that is to be expected in any well run establishment. Thank you Barts! a brilliant evening out. It wasn't the easiest bar to find but that was all part of the fun. Live Music was excellent and not so loud that you couldn't hear yourself think, as is the case in many smaller london bars. Very very busy however. I will definitely be returning. Had such a fun night at Barts!! Having heard lots of good things about it I was expecting something quite special, and was not disappointed! Definitely the hidden jewel of Chelsea.. I loved the dressing up box and 20's style prohibition decoration. The attention to detail was great, especially the amazing cocktails served in teacups. Looking forward to trying the bar food next time! What A gem! I had heard a lot about Barts from friends but hadn't managed to visit until recently - and wow have I been missing out! Barts is the quirkiest, most fun bar/restaurant I've been to in a very long time. It is great value for money, serves delicious food, plays great music, delicious drinks and has fantastic decorations including a fancy dress box which was just the icing on the cake! I can't wait to get back in there to try more of the special 'teapots' whilst wearing a poncho and a wig! Decent concept done horribly. Let's get the "secret stuff" out of the way: Barts Speakeasy "Somewhere on Sloane Avenue" is the hotel bar of the posh, stuffy Chelsea Cloisters hotel. Someone, somewhere has come up with a brilliant wheeze (somehow the Boris Johnsonesque slang seems appropriate) to turn a small hotel bar even guests would ignore into a buzzy tourist trap. The fun starts dissipating round about the time the charmless manager grudgingly admits you and goes downhill from there. 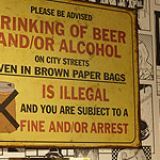 Pointlessly loud - and bad - music, decor with all the charm of a Wetherspoons, bad layout making the bar even less accessible and apparently no air conditioning or ventilation were some (but not all) of the factors that sapped the fun out of the experience. 3 lagers and a glass of house white wine came came to £19, so I suppose on prices Barts should be congratulated for only taking the p more as much as other central London pubs. I cannot comment on cocktails except to say that the atmosphere could hardly have been less condusive to enjoying them. On a personal note, it was an extremely cheap night out or me as I abandoned 2 attempts to get a round in after 20 minutes of getting nowhere at the bar. My friend had slightly more success by infiltrating a pack of braying Sloane girls. Not a place I'd reccommend to anyone for any reason. Spiffy - The "Scottish Sailor" initialled "HG" and his tequila did nothing to spoil. We were pretty disappointed, expected a secretive cosy bar but it was nothing compared to the really hidden unlisted bars you get in Berlin and elsewhere in Europe. Very made-up spanking new place, lacks the authenticity, character and laid-back vibe of London bars like Freud or Dragon Bar (now closed), even Shunt would be a much better experience. The waitress, a typical shoreditch trendy type was pretty stuck-up.. despite serving up the wrong order, she muttered under her breath that the wrong wine cost the same price anyway..
You get it, the crowd there's pretty much boring city-banker types. Absolutely fantastic place. What a gem. So glad I found it! Great cocktails at a very reasonable price and wonderfully friendly staff. I can't wait to be there again. See you soon Barts. Sorry - Champagnes are too expensive. You can hardly move or hear in there. I am surprise no one noticed. The most original and fun bar in London-absolutely genius. By Charles J A C R.
Have to say that after hearing so much about it, it was a joy to walk into a place that lived up to the expectation. Thoroughly enjoyed the atmosphere, the staff were brilliantly attentive, and the fact that it;s located off the street makes it a complete delight. I plan to attend multiple times a week. Great atmosphere, thought the ambience was very well created. Pricing was reasonable and the the manager seems very capable. I shall definitely be visiting again soon. As speakeasy bars become more and more common in London, this quirky old-timer still stands out as one of the best. 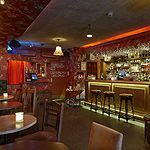 Finding this venue is where the fun begins – unlike other so-called London speakeasies, Barts is actually pretty well hidden. A short walk from South Kensington tube station, the venue is situated inside a pretty standard looking apartment building – ask the reception staff and they'll point you in the right direction. Once you've located the black door, lantern and the Mickey Mouse wallpapered entrance, ring the bell and wait for a pair of eyes to appear through a small hatch to size you up and let you in (or book ahead to guarantee entry). Inside the tiny den-like bar, you'll immediately be taken aback by the quirky Prohibition-style décor, where knick knacks fill every available space – think old radios, stuffed animals, antique ornaments, mirrors, books, a rather interesting Mona Lisa painting, sofas, chandeliers and an abundance of brown tables and chairs. There's even a fancy dress box full of wigs and costumes. Outside, there's a quirky, Cuban-style 'herb garden' with a cove, shisha pipes and garden furniture. In the cooler months, heaters help keep the area bearable. Undoubtedly, the place is pretty cool and the staff know it. They don't have to go out of their way to be overly friendly – people will come to the bar anyway. Service is very efficient even at busier times, however. The clientele is made up of a mixture of a few tourists, local 'Sloanie' types and regulars who hold a key card to get in whenever they choose. As with many speakeasies (and Chelsea bars) there's a pretence about the bar, but as the night goes on this atmosphere eases. The mellow playlist is well complemented by a live jazz night every Wednesday – arrive early to get a good spot. There's a snack menu if you're feeling peckish, which features mini dishes from around the world. Try the yummy Mexican-themed nachos (£5.95). The toppings are generous and evenly distributed – medium-flavoured cheese comes layered along with creamy sour cream and chive and fresh-tasting guacamole, with Uncle Bart’s special tomato sauce in pots on the side. This is where the venue really stands out – the extensive menu really does offer something different. Everything from cocktails in teacups to your classics – they don’t come cheap, but are definitely worth the splurge. For a super fresh cocktail, try the drinks made with ingredients from the herb garden. The Basil Fawlty (£11.50) is really delicious – Bombay Sapphire gin, fresh basil leaves, pineapple and lemon are combined for a refreshingly aromatic and delicately peppery tipple. It's almost so smooth, you'll have reached the bottom of the glass before you realise! The Rosy-Fingered Dawn (£11.50) is a much sweeter cocktail – made with muddled Grey Goose Pear vodka, fresh rosemary, pear and lemon, it's almost hard to taste the herb through the syrupy flavour, but those with a sweet tooth will find it divine, nevertheless. A really experimental drink is the Pickled Ploughman (£13.50). Made with gin, Chambord, Blue Stilton (yes, really), grapes, honey and grenadine, this really isn't for everyone - make sure you use a straw or the lump of blue cheese will be very close to the tip of your nose as you sip! Thick, strong and overpowering in flavour, you'll either love or hate it. The Smoke Screen (£19.50) is really one to impress, however. Served in a Dewar's Signature box alongside apple-scented tobacco and chocolates or cheese and honey, the super strong drink is made with Perique Tobacco liqueur, Dewar's 18 Year Old, Angostura Bitters, orange and sugar. Open the box and smoke will fill the table. 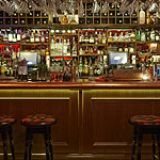 If cocktails aren't your thing, the champagne and wine list is also extensive (ranging from £24 for house plonk to £475 for the Dom Perignon Magnum 2002), while draught beers include Asahi Super Dry and Samuel Adams (£2.75 a glass,£4.40 a pint, £8.95 a stein) and bottled beers include regulars such as Heineken and Corona. 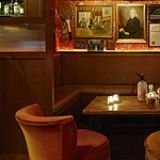 It may be a pretentious Chelsea bar, but with outstanding cocktails and a quirky one-of-a-kind setting, this speakeasy is a must-visit. Good luck on getting in, though!